The autumn sun filters shadows through the thin stalks of the corn maze. Following the sound of chirpy giggles, you’ll weave your way through a jungle of crisp leaves. Meandering around this harvest time labyrinth, embrace the simple joys of family fun. From winding through a corn maze to jumping in a hay pile, taking your military family to a pumpkin patch doesn’t have to be an extravagant outing! Following are a handful of ideas to save a little money and make the most of a trip to a fall-themed farm. When looking for a family-friendly activity, a quick click on the MilitaryByOwner site brings up blog posts highlighting fall fun in different regions. In addition, search for farms nearby that host a pumpkin patch and autumn-themed events. Looking at the variety of things to do, take note of individual fees for games or attractions. 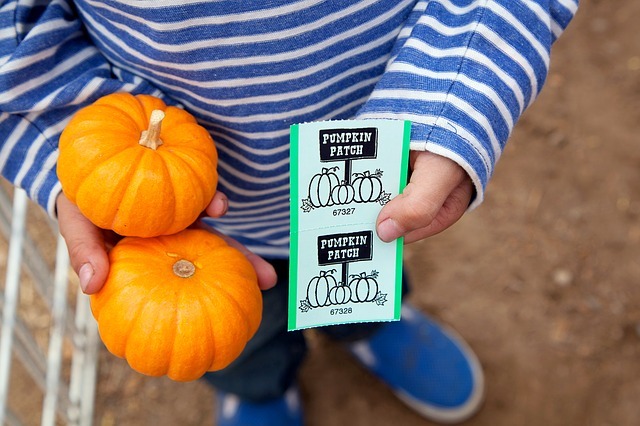 Know what to expect ahead of time so you’ll feel more prepared for your pumpkin patch trip. Coupons - Often, a patch will advertise their farm with a coupon for admission found on their website or with promotional ads. Discounts - Keep an eye out for discounted rates for military families, homeschooling students, church groups, or scouting troops. Incentives - Additionally, the farm might host a canned food drive where donating non-perishable items will reduce the admission costs. If the policies of the farm allow guests to bring in outside food, a pumpkin patch can be the perfect setting for an autumn picnic. Gathering by a hay bale or dining at a picnic table, the goodies you’ve packed will fill the tummies of your crew. Bring along snacks to avoid spending a fortune at the concession stand. When the warm sunshine brightens an easy Saturday, you and yours, along with 100 other families, might be planning a pumpkin patch trip! By avoiding the peak time for visitors, your family can make the most of the fall-centric activities. If your schedule allows, plan a mid-week trip to the local pumpkin patch. The crowd is usually smaller and the lines for different attractions are shorter. If you know a community event is happening elsewhere, such as a big game or a popular fair, during that time frame there may be less of a crowd gathered at the farm. Your busy bunch has been waiting all year for a ride in the wagon pulled by a tractor. Your kiddos frolic and follow the twisting vines amidst the field. Soon, you’ll pick just the right pumpkins for your porch. While spending time around the farm, it’s easy to get caught up in the splendors of autumn! However, rather than buying a full peck of pumpkins from the patch, compare the per pound price to what the gourds are selling for at local stores. You can still have the fun of purchasing the pumpkins you’ll pick from the vine. But, when buying pumpkins for pies, opt for the ones at your go-to grocery store. Not every pumpkin patch has to be a gigantic amusement park. Sometimes, it’s nice to find a small-scale effort tucked along a rural road. Instead of a banner on a billboard or a flashy online ad, you can find a hidden gem of a patch by the line of pumpkins edging the property. Often staged on a portion of a working farm, a grower may add in a few family-friendly activities such as a beanbag toss game or a hay bale maze. But the overall intent is to showcase the produce - the fruits of their labor. You might be surprised when a visit to a modest pumpkin patch becomes a memorable family experience. As the fall season rolls along, be on the look out for little ways your military family can save money and still delight in the joys of this special time of year. If you’ve found a good deal at a pumpkin patch where you're stationed, feel free to comment and share the scoop!